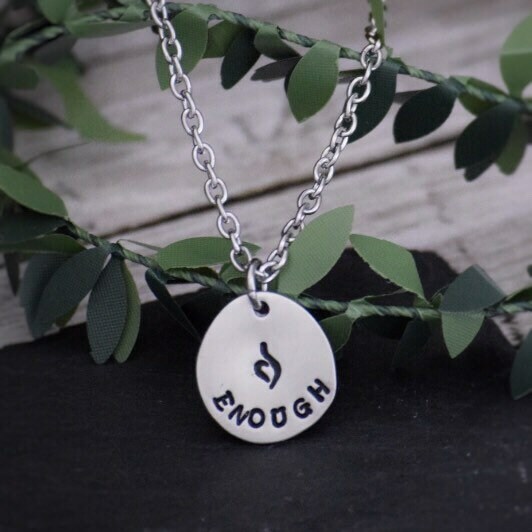 Inspirational and beautiful necklace is a reminder of your strength and perseverance! You are ENOUGH!! 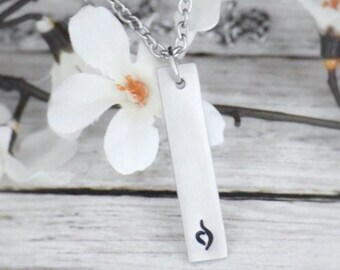 Necklace is hand stamped with the NEDA eating disorder recovery symbol and has the words ENOUGH below it on a 3/4” pewter pendant with a brushed matte finish. Cable chain is hypoallergenic, non tarnish and durable stainless steel. Choose your preferred necklace length as you check out; you can also add an additional 2” chain extender when you check out. If you prefer a different length, please put it in the "note to seller". Please see the last picture for a visual reference of necklace lengths. All items are hand stamped by me, not a machine! Due to the handmade nature of my jewelry, no two pieces are exactly alike. This adds to the charm and uniqueness of these items! Due to casual wear, the letters may appear less dark over time, especially if jewelry is exposed to water. But there is an easy fix - simply color inside the letters with a thin black permanent marker and wipe away any excess with a polishing cloth, damp wipe or a cloth with a bit of rubbing alcohol. All orders are gift wrapped in a silver organza bag. 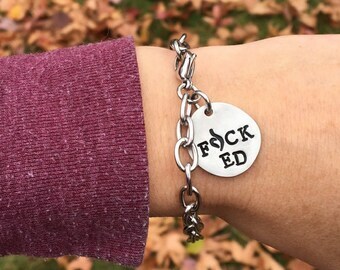 A portion of the profits from each sale are donated to the National Eating Disorder Association (NEDA) and the American Foundation for Suicide Prevention (AFSP) for mental health awareness. Absolutely beautiful! I got one for me and one for my best friend. I can’t wait to give it to her. I love that it says ‘Enough’. Perfect reminder for anyone recovering. I love it so much and it reminds me i am enough. Item exactly as described, quick shipping. Thank you! I make each wrap bracelet to your personal bracelet size. To ensure you order the correct size bracelet, measure snug around your wrist and choose the size that is closest to your wrist measurement as you check out. Do not add any extra length to your measurement, I will do this for you when I make your bracelet. There will be three sizing loops for the button clasp. When you receive the bracelet, you can choose the loop that fits your wrist best and extra loops can be cut off with scissors (make sure not to cut the knot off before the loop that fits you). You can always tell me your exact wrist size in the "note to seller". Take off earrings before swimming, showering, applying face lotions or MAKEUP (especially important for white fabric!!). If earrings get stained, try to wipe clean with a damp cloth. Items are shipped through USPS first class mail with free tracking services provided. You also have the option to upgrade to Priority Mail. Please make sure your shipping address on Etsy is updated. Almost all of my jewelry is made to order - therefore processing times vary depending on individual requests and personalization. If you have questions about processing times, please message me! I am happy to answer any questions you might have! Once an item is shipped, I no longer have control over if it arrives to you in time or to the correct address so please double check! Make sure to check the tracking information on your package through Etsy or the USPS. International customers, please be aware that your country may charge an international customs fee in order for you to receive your package, your local post office (the one sponsored by your government) will hold your package until this fee is paid. Please check with your country if this fee is required. It is at the expense of the customer. Almost all items will be packaged in a silver organza gift bag. I package all items carefully in a bubble wrap envelope. Stud earrings are packaged in a gift box tied with a ribbon. If you order more than one pair of stud earrings, I will put them all in the box together, in order to save resources. If you would like them boxed separately, please let me know. If your order is a gift, please let me know and I will leave out the receipt. If you are directly mailing your purchase to someone as a gift, do not forget to put their name and address as the mailing address.